This book treats the different current as well as unusual and hitherto often unstudied physico-chemical and surface-thermodynamic properties of water that govern all polar interactions occurring in it. These properties include the hyper-hydrophobicity of the water-air interface, the cluster formation of water molecules in the liquid state and the concomitant variability of the ratio of the electron-accepticity to electron-donicity of liquid water as a function of temperature, T. The increase of that ratio with T is the cause of the increase in hydration repulsion (“hydration pressure”) between polar surfaces upon heating, when they are immersed in water. 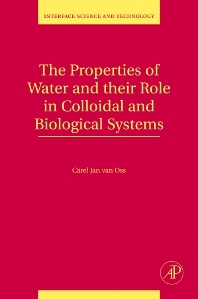 The book also treats the surface properties of apolar and polar molecules, polymers, particles and cells, as well as their mutual interaction energies, when immersed in water, under the influence of the three prevailing non-covalent forces, i.e., Lewis acid-base (AB), Lifshitz-van der Waals (LW) and electrical double layer (EL) interactions. The polar AB interactions, be they attractive or repulsive, typically represent up to 90% of the total interaction energies occurring in water. Thus the addition of AB energies to the LW + EL energies of the classical DLVO theory of energy vs. distance analysis makes this powerful tool (the Extended DLVO theory) applicable to the quantitative study of the stability of particle suspensions in water. The influence of AB forces on the interfacial tension between water and other condensed-phase materials is stressed and serves, inter alia, to explain, measure and calculate the driving force of the hydrophobic attraction between such materials (the “hydrophobic effect”), when immersed in water. These phenomena, which are typical for liquid water, influence all polar interactions that take place in it. All of these are treated from the viewpoint of the properties of liquid water itself, including the properties of advancing freezing fronts and the surface properties of ice at 0o C.